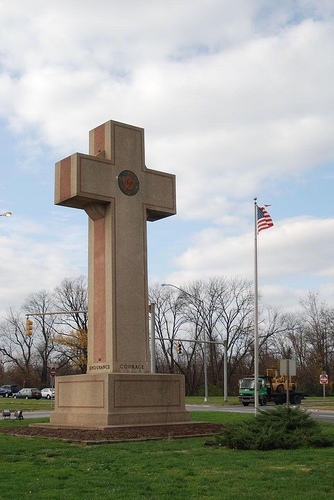 Sitting at the intersection of Bladensburg Road, Baltimore Avenue and the National Defense Highway just over the border into Prince George’s County is the Bladensburg Peace Cross, a forty-foot stone cross, notes those from Prince George’s county who fought and died in World War I. Inscribed with their names, and the quote from Woodrow Wilson, “The right is more precious than peace. We shall fight for the things we have always carried nearest our hearts. To such a task we dedicate our lives,” the monument is a towering landmark just outside the District. This weekend is Memorial Day, when we commemorate those who served our country and gave their lives in service of a nation, giving their “last fullest measure of devotion,” in service of family and friends. This is a weekend where we remember all who have died in service of nation, in addition to barbequing, watching baseball, and carrying on. Enjoy the weekend, toast the departed and their memory. We’ll be back on Memorial Day with light coverage. I remember as a child hearing that the area around the cross flooding every time it rained closing the road between Bladensburg and Cottage City. I also remember going to parades there on Memorial Day.